Trade talks between the US and China are set to resume this week in Washington, just before the next round of levies targeting $16 billion worth of goods kick in on August 23. Market participants are hoping that talks will help to ease the ongoing trade tensions between the two countries. In oil, market participants are waiting for news on when India's Reliance Industries will lift the force majeure from its export-oriented refinery in Jamnagar, which shut its fluid catalytic cracker. This comes at a time when several refineries and turnarounds in Asia have squeezed supply while demand remains strong, with buyers securing pre-winter supply. Alcoa workers in Western Australia voted to continue their industrial strike indefinitely, while output rates in Brazil and Jamaica remain below capacity. The S&P Global Platts Australian alumina price rose 3.4% in the past week, and was up 17% month on month due to continued supply concerns. In agriculture, market participants expect Australian premium white wheat prices to remain supported in the near term as farmers remain reluctant to forward sell in view of relatively lower production figures for the 2018/2019 marketing year. And in thermal coal, restocking begins in India as the monsoon season comes to an end. The Chinese market, on the other hand, is on an extended pause as the yuan's volatility has been eroding Chinese importers' buying power. This week: Asia gasoline price rallies, workers' strike at Alcoa's Australian operations continues, and Indian thermal coal buyers' restocking activities begin. But first, trade talks between the US and China are scheduled to resume this week in Washington, just before the next round of levies targeting $16 billion worth of goods kick in on August 23. Market participants are hoping that talks will help to ease the ongoing trade tensions between the two countries. Is this the beginning of the end of the trade war? Share your thoughts on Twitter with the hashtag PlattsMM. In oil, all eyes are on gasoline, after its price rallied to one-year highs last week on supply disruptions. Market participants are waiting for news on when India's Reliance Industries will lift the force majeure from its export-oriented refinery in Jamnagar, which shut its fluid catalytic cracker. 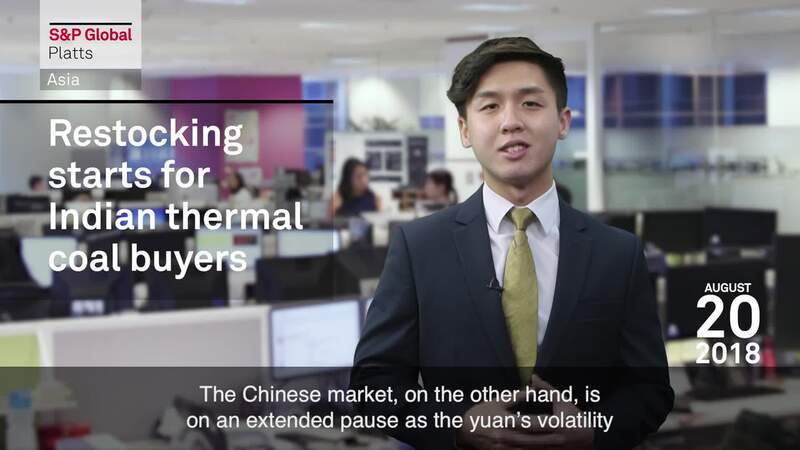 This comes at a time when several refineries and turnarounds in Asia have squeezed supply while demand remains strong, with buyers securing pre-winter supply. Supply concerns are also what's keeping alumina prices up. Alcoa workers in Western Australia voted to continue their industrial strike indefinitely, while output rates in Brazil and Jamaica remain below capacity. The S&P Global Platts Australian alumina price rose 3.4% in the past week, and was up 17% month on month due to continued supply concerns. Will alumina continue to rally? And will China export volumes and prices rise further? Our metals team will keep you posted on that. In agriculture, the Australian premium white wheat hit new highs last week on strong demand and tight supply of old crop. Market participants expect APW wheat prices to remain supported in the near term as farmers remain reluctant to forward sell in view of relatively lower production figures for the 2018/2019 marketing year. And finally in thermal coal, restocking begins in India as the monsoon season comes to an end. The Chinese market, on the other hand, is on an extended pause as the yuan's volatility has been eroding Chinese importers' buying power. Some Australian thermal coal cargoes have been deflected from the China market and are moving on to other destinations such as India, Europe, and Turkey. This shift has been seen displacing some cargoes from Russia and the US. Thanks for kicking off your Monday with us. Have a great week ahead!